Vitaliy Dubil, EMBA’16 recently won the Extraordinary People Inspiring the IE Community (EPIC) awards* which are sponsored by Baume & Mercier. 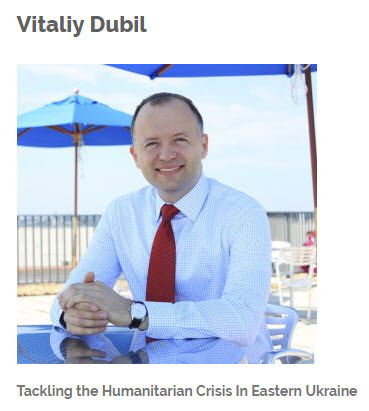 In addition to being a Lead for the Global Partnerships and Fundraising team at the International Finance Corporation (IFC), he’s using his professional experience and connections in the West to devote himself to public service by helping with one of the most serious aspects of the humanitarian crisis in Ukraine: supporting the delivery quality medical services. In fact, the aim of his project is simple: periodic delivery of medical supplies from the United States to hospitals in Ukraine. See Vitaliy Dubil’s full story on the IE EPIC web page here. *IE Global Alumni Relations launched EPIC, Extraordinary People Inspiring the IE Community, with the objective of sharing the stories of outstanding IE alumni who inspire the IE network to pursue continuous learning and excellence. Today, IE’s alumni network includes more than 55.000 professionals in 151 countries worldwide. IE’s EPIC alumni are accomplished leaders, entrepreneurs, and role models that show commitment to society and deliver exemplary work in their fields of knowledge throughout different stages of their lives in line with IE values taught in our Undergraduate and Master´s programs: Diversity, Social Innovation, Humanities and Entrepreneurship.